The cross and the altar in Spirit of Faith worship center symbolize the fusion of the old and the new. Rian Boschee, of Woonsocket, handcrafted the cross, formerly hung in the United Methodist Church in Woonsocket. 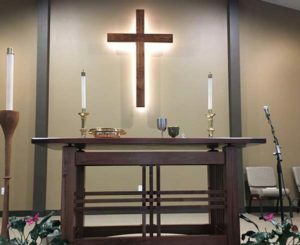 Stephen Davis, of Woonsocket, and Aaron Roth, of Letcher, handcrafted the altar specifically for the new Spirit of Faith church building. An altar discovered by Pastor Rhonda inspired its design. “Saved by grace, gathered in faith, called to serve” is the mission statement of the Spirit of Faith Lutheran-Methodist Church of Woonsocket. The congregation held the much anticipated dedication service of its new church building on Sunday, Jan. 27. 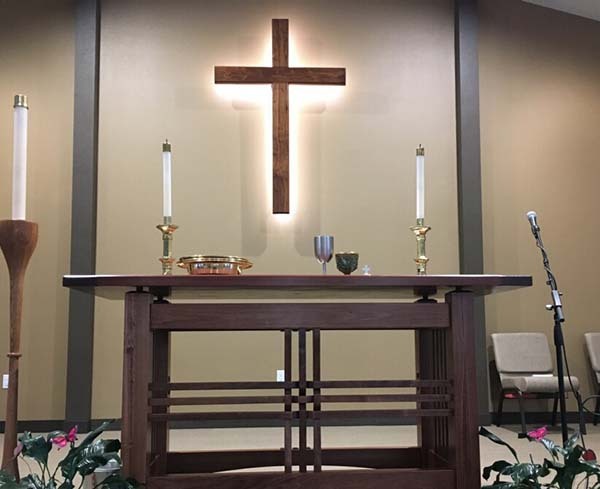 Bishop David Zellmer of the South Dakota Synod of the Evangelical Lutheran Church of America (ELCA) dedicated the worship center as a holy space. He expressed his appreciation for all the work done to make the day possible and challenged the congregation to raise up disciples in Jesus’ name. Bishop Zellmer credits Spirit of Faith for being a unique congregation that demonstrates how two faiths can come together. Each congregation gave up something precious to them to build something brand new. …Read on and see more pictures in this week’s issue of the Sanborn Weekly Journal.